I first saw this quote on a poster when I was seventeen. I only half understood the glorious illogicality of feeding the soul at the possible expense of the body, and wondered, too, why one would choose hyacinths, lovely and fragrant though they are, rather than musky-scented, velvet-petalled roses for example, or any other beautiful flower. Nonetheless, the idea of "hyacinths to feed your soul" remained with me, infusing each spring flowering with an extra layer of meaning. 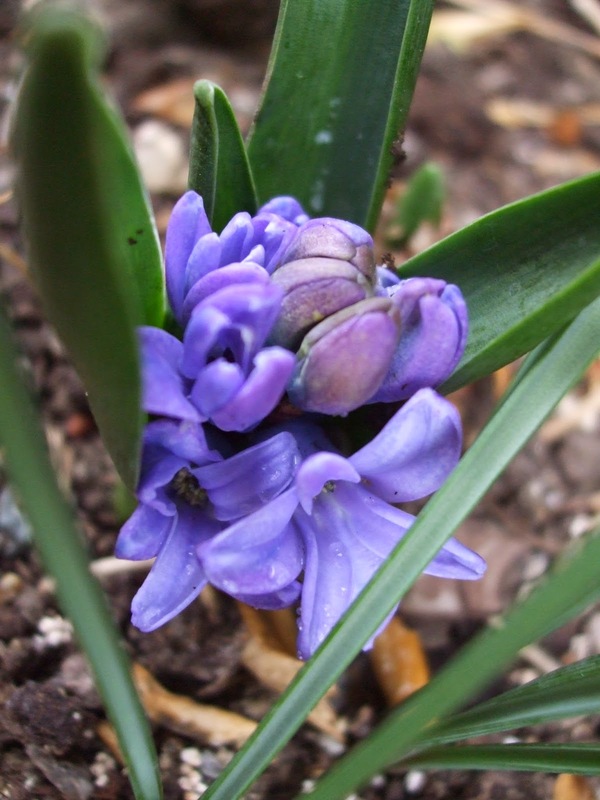 Hyacinths are one of several heralds of spring, picking up the baton from snowdrops and crocuses and handing it on, after a while, to later blooms. In a late spring - as we had last year - the order is delayed but maintained. Thus on May 6th 1882, during a very late spring, as Janet Stuart stood beside a bed of blue hyacinths, the Word of God came to her and she "saw it all". It became a significant anniversary for her, this moment when she knew her life's purpose; but later seasonal normality meant she was never again to keep the anniversary with hyacinths, flowers which had now become special to her. Her remembrance had to be different, her soul fed in a more interior way. Except that... A few days ago a sister living in Roehampton emailed the rest of the centenary organising committee to tell us that a blue hyacinth had started to come out in their garden! So naturally I took photos of it when I went there yesterday! It's a tiny burst of bright blue, only a dozen or so yards from the Sacred Heart chapel, where Janet is buried; a tiny burst of something which, according to the laws of nature, shouldn't be there. The age-old meaning of blue hyacinths is constancy, and maybe that's what this little burst of blue is all about. It's a reminder that the Word of God isn't confined to certain dates or seasons; neither is the constancy of his love limited by the laws which he himself created. Just like that little hyacinth God can sneak in and burst out on us when we least expect him! And maybe too, God has helped Janet to find this unique and unexpected way of saying thank you for a lovely centenary conference!